Andy Birkett was a class above the rest on Sunday as he cantered home ahead of Thulani Mbanjwa to clinch the 2016 Ozzie Gladwin Canoe Marathon presented by Parklane Superspar while Abby Solms’ dominance continued as she clinched the women’s spoils. 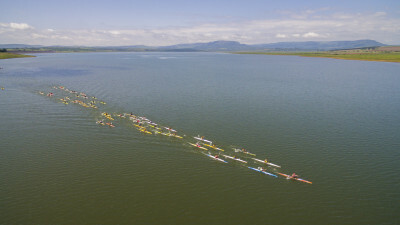 With precious few opportunities to hone their river skills during the on-going drought, many of KwaZulu-Natal and Gauteng’s top elite racers and social paddlers alike took full advantage of the golden opportunity to spend some time on the water ahead of next year’s fast-approaching FNB Dusi Canoe Marathon. Birkett, who also clinched the race’s crown in 2014 and 2015, made it three from three as he charged across the 4km flat water stretch on Albert Falls Dam, the 3km portage around the dam wall and the enjoyable 18km of rapids and weirs on the upper uMngeni River. “I am stoked to get the win here at the Ozzie Gladwin,” said the Euro Steel athlete. “It is obviously still very early on in the season but I just really enjoy racing and so it was great to be out there paddling again. “It is also great to see so much depth in the field ahead of next year’s Dusi!” he added. While it was Sbonelo Khwela who led Birkett, Mbanjwa and eventual third place finisher Banetse Nkhoesa down the first weir after the portage, a broken paddle at Cascades Rapid dashed the Euro Steel/Red Bull competitor’s title hopes, leaving the remaining trio to fight it out for the podium places. After getting away from Nkhoesa, Birkett and Mbanjwa then went head-to-head for the race spoils and the 2016 KZN K1 River Marathon Championships crown. “I was with Andy up until just before the second, compulsory portage around the gum trees but he was incredibly strong on the run and I just couldn’t stay with him any longer,” explained Build it/Williams Hunt’s Mbanjwa. “I’m very happy with where my paddling is at the moment though and even though my running is not quite there yet, I think my experience counts for a lot too. Euro Steel/Computershare Change a Life’s Nkhoesa clung onto the bottom step of the podium after a tough day on the water, in the process managing to claim the Under-23 Men’s spoils as well. Fellow Under-23 racer Tom Lovemore overcame his running difficulties with a powerful paddling display that saw him claim an impressive fourth place. Czech Republic star Jakub Adam rounded out the top five while Khwela’s broken paddle forced him to limp his way across the line in tenth place. In the women’s race the hard-fought, pre-Dusi clash between Solms and Olympic bronze medalist Bridgitte Hartley that many had hoped to see unfold was sadly over not long after it began. Having worked hard to earn the early advantage on the portage, Solms was unknowingly left unrivalled for the rest of the encounter after Hartley soon found herself tangled in a thorn bush shortly after completing the run and getting onto the upper uMngeni River. “It’s nice to win and the fact that today was also KZN K1 Champs was a nice little bonus too,” explained Euro Steel/Gara Racing Paddles’ Solms after claiming her fourth title in five years. “I managed to open a bit of a gap on Bridgitte on the portage but her paddling is just so strong at the moment so I thought she’d actually catch me again on the flats. Young schoolgirl, Christie MacKenzie continued her remarkable recent run of form to race home to third place overall and the junior girls title. The day’s senior racing was preceded by some hotly contested yet fun and friendly guppy racing as some of tomorrow’s stars enjoyed their slice of the action as they completed their lapped outing around Albert Fall Dam.